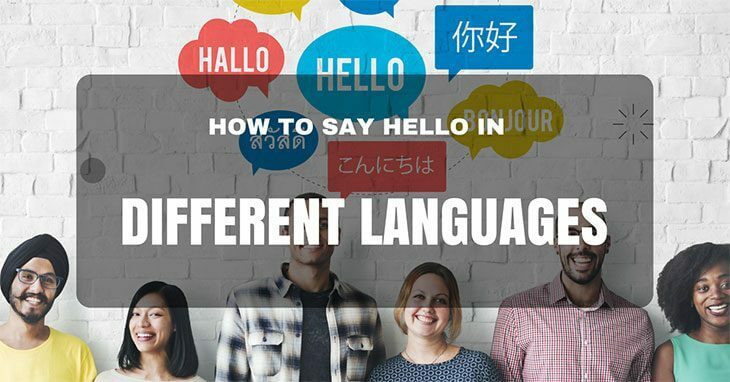 We have collected an informative list for you on how to say hello in different languages, and a few other countries for good measure too! Wherever you travel and wherever you go there are always a few words you should learn before you set off; not only is this courteous but can get you surprisingly far! Everyone appreciates how hard it is to learn a new language and as such you will never be shunned for trying. There are behaviours and gestures that transcend language, smiles and laughter for starters, waving and crying are secondary. The most commonly used word for hello is ‘konnichiwa’. This is pronounced ‘kon-ni-chi-wa’. Japanese is a tonal language but try not to put on a fake Japanese accent. Pronounce ‘kon-ni-chi-wa’ quite quickly but maintain sincerity and try not to talk with each syllable sounded out. If you’re having trouble however the Japanese are gracious and will be encouraging of your attempts to speak their language. If you are answering your phone or a video call then the most commonly used greeting is ‘moshi moshi’. It is pronounced ‘moh-sh moh-sh’, really very easy. Although, do remember, this is strictly used over the phone not in person. How to spend one week in Japan? There are so many different language spoken on mainland China; Mandarin and Cantonese being the most widely spoken. Unlike in Japan bowing is not customary when you greet people in China, although this is a common misconception. To say hello in Mandarin you say ‘Nǐn hǎo’, again, same as with Japanese try not to over pronounce or put on a fake accent, doing so could cause offence. Likewise in Cantonese ‘‘Nǐn hǎo’ is a perfectly acceptable greeting. That, or, ‘fùnyìhng’ which means ‘welcome’. Answering the phone in Chinese is very easy too, most commonly people say ‘wéi’ or in places that have greater western influence then ‘hello’ is often heard too! You can teach yourself Chinese using this app! There is a big difference between the dialect spoken in North Korea and the dialect spoken in South Korea. So much so, they are nearly totally different languages. With that said, it’s highly unlikely that you will find yourself in North Korea, sadly meeting many North Koreans round the world either. South Korea is open and very much worth visiting. To say hello in Korean you say ‘annyeong haseyo’. Bit of a mouthful yes?! Luckily, when meeting with friends you can simply say ‘annyeong’, likewise with any informal situation. In formal situations you should, without fail, us ‘anyoung hashimnikka’. This is pronounced ‘’ahn-yong hahshim-nee-kah’’. There is no such language as ‘Indian’ rather the most commonly spoken language, and therefore official language of India is Hindi. In Hindi you use the phrase ‘Namaste’ as a greeting in all circumstance. This is a deeply spiritual word and should be used with the utmost sincerity. When you say ‘namaste’ you should always join your hands together and bow your head a little. When people in India answer their phones they do so with a ‘hi’ or ‘hallo’. Other common languages in India include Bengali, Telugu, Marathi, Tamil, Urdu, Gujarati, Kannada, Malayalam, Odia and Punjabi. Fear not, ‘namaste’ is universal! Like Japanese and Chinese the language of Thailand, Thai, is also tonal. Thailand is also known as the Land of Smiles and this is certainly true. You will be met by smiling faces wherever you go. To say hello in Thailand you say ‘S̄wạs̄dī’ this is pronounced ‘sa-waa-dee’. Then, much like in French you must add the masculine or feminine ending. Women should add ‘kaa’ making the phase sound like this ‘sa-waa-dee-kaa’. The men should say something a little different. In the Thai language the masculine ending is ‘krab’. So, guys should say ‘sa-waa-dee-krab’. Like in India it is customary to join your hands and bow when you say hello in Thailand. This is known as ‘wai’. To greet a Thai person, especially in a formal situation, without offering ‘wai’ would cause great offence. Top 7 Best Areas to Stay in Bangkok This 2017! Saying hello in Indonesia is super simple. The Indonesian word for ‘hello’ is ‘halo’. You should have no trouble remembering that one! The Indonesian language is known as Bahasa and is a variation on the Malay language, as such you will find a lot of cross-over if your visit both Malaysia and Indonesia. There are dialects and regional languages too, for example Javanese and Minangkabu, Batik too. Panic not, ‘halo’ transcends all of these. Where to Stay in Bali in this 2017? As we said before, Indonesian is a development of the Malaysian language and as such it is perfectly acceptable to greet people with a friendly ‘halo’. If you want to sound a little more like a local you and greet people with time related phrases. For example, ‘Selamet Pagi’ means good morning. This is pronounced ‘Suh-la-mat pa-gee’. To say good afternoon is a little more complicated but by no means challenging ‘Selamat tengah hari' is what you should say. Pronounce it like ‘suh-la-mat teen-gah har-ee’. The Google Translate App works really well in Malaysian and will help you along your way! When is the Best Time to Visit Malaysia this 2017? Vietnamese is not a language you often hear outside of the country itself and so this is probably a new word, rather phrase to many of you. Even if you never go to Vietnam you never know when this question may come up in a Pub Quiz! To say hello in Vietnamese you say ‘xin chào’. The ‘chào’ part of the phrase is what translates as hello but you would rarely use this word alone, ‘xin chào’ is the only real acceptable greeting. The official language of Myanmar is Burmese and the alphabet in particular bares little resemblance to many other language. Despite the tricky alphabet getting hello in Burmese is very easy. The Burmese people greet each other using the phrase ‘h-lo’. Looking at it on paper seems odd but think about it, it’s just the same as our hello without the vowel ‘e’. Another common greeting is ‘min-ga-la- ba’ which means welcome. Both phrases are used equally but if you want to be seen to be making an effort with your language skills then the phrase ‘min-ga-la- ba' is better for you. Hong Kong has two official languages, English and Cantonese. As you well know, or we would hope you do, the most common greetings are English is hello, hi or hey. It matters little if you’re talking to an English speaker or Cantonese speaker saying hello in Hong Kong is perfectly acceptable. As we mentioned above the word for hello in Cantonese is ‘Nǐn hǎo’. There are many Cantonese speakers in Hong Kong but as a tourist the majority of people you will come across will be able to speak English to a high level. So that covers most of the Asian countries that are popular tourist designations. Now it’s time to learn how to say hello to your fellow travellers! Not only is this polite but also makes you seem more worldly and even better travelled! How Many Days in Hong Kong? Do you know how to say hello in Greek? No? Well, now is as good of a time as ever to learn! To say hello in the Greek language you say ‘Chaírete’. Although the Greek language has its own alphabet it is easy to spell their words phonetically using the latin alphabet. The Greeks have a tendency to be informal the majority of the time, even when meeting new people and as such you may find yourself being greeted with a ‘Yassou' rather than ‘chaíete’. ‘Yassou’ is pronounced ‘yahh-soo’, really very easy! We’re sure you already know this! Spanish is one of the three most widely spoken languages in the world. Even children get taught a little Spanish from a very early age by watching TV programmes like Dora the Explorer. You’ve had enough time now, can’t remember?! To say hello in Spanish you say ‘hola!’. If you want to test yourself try phrases like ‘buenos días’ and ‘buen día’ meaning good morning and good day. French is the language of love, romance and food! The French language does bare some resemblance to English and on your travels you are bound to meet plenty of French speakers. There are countries in Africa where French is the primary language and in the Caribbean too. French is a very useful language to learn, at least understand the basics of. To say hello in French you say ‘bonjour’. Although French does use masculine and feminine this does not apply to the greeting of ‘bonjour’. Of an evening you should drop ‘bonjour’ in favour of ‘bonsoir’ which means good evening. You may get some funny looks if you use ‘bonsoir’ during the day time so be sure not to use it until after dusk! Wherever you go you are bound to meet Italian travellers; the Europeans just love to travel. Must like French, Italian is a very romantic language and the people are possibly even more obsessed with food than the French! That said, you must know some Italian words without even realising it ‘pizza’, ‘pasta’ and ‘spaghetti ’ are all Italian words that we have adopted into the English language. To say hello in Italian you must say ‘ciao’ pronounced as ‘chaow’. To say goodbye in Italian you say ‘addio’ much like in Spanish where you say ‘adios’. How Many Days to Spend in Rome? Much like in Indonesia to say hello in German you say ‘hallo’ rather than hello. The German ‘hallo’ is much harsher sounding that the English ‘hello’ but is no less friendly or sincere. Again, it is widely acceptable to say ‘hi’ or ‘hey’ especially with people that you know. To say ‘good morning’ in German you say ‘guten Morgen’ which sounds surprisingly similar! You may meet some Russian travellers during your vacation, must like German Russian is a very harsh sounding language but despite the Cyrillic alphabet can be easy to learn. To say hello in Russian you say ‘privet’. The is pronounced ‘pre-vyet’. Is Russia Part of Europe or Asia? Although part of the USA Hawaii does have it’s own Polynesian language, but English is widely spoken too! To say hello in Hawaii you say ‘aloha’. It’s not a cliche! That's actually how Hawaiian people say hello! Saying hello in Hebrew is easy! Much like Namaste the word for hello in Hebrew can mean many things. You say hello in Hebrew by saying ‘shalom!’. Whether you’re heading to just one destination in Asia or spending time travelling through the continent ticking off as many countries as possible, you should always endeavour to learn a little of the language. We hope this guide has given you a bit of an insight and opened up new possibilities for you in terms of making conversation abroad, both with locals and with your fellow travellers from around the world! Saying hello is really important. Not only does it show respect but it is also the gateway to endless friendship opportunities. Always say hello when you're on the road and never be too shy to try!